The hot pair, Surya and Shruti, were spotted at the sprawling lush green lawns of IIT, Chennai, one of the top educational institutions in the country. Murugadoss was canning a few shots with the lead pair on the campus at midnight recently for his upcoming socio-fantasy flick '7aam Arivu'. 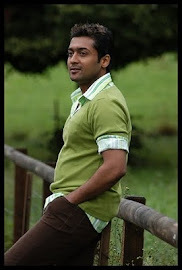 Produced by Udhayanidhi Stalin, sources reveal that Surya will be seen in a dual role, playing a contemporary character in one scene and another through flashback, in a previous birth. A few scenes were also shot at the busy G.N. Chetty road in the city, but unlike the Ranganathan street episode where the actor was mobbed, this time around the filmmaker was careful enough to choose the wee hours for his shooting.